I'm finally done with the next major upgrade to WildLog. 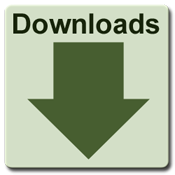 You can download WildLog v4.3.1 over here. The biggest improvement in this new version is the overhauled mapping functionality. The new maps now use a similar approach as the reports. You can now choose which Observations you wish to display on the map using the provided Observation filters. WildLog is now using the Google Maps API for most of the online maps, instead of the old OpenStreetMap, which provides much better base layers for the maps. 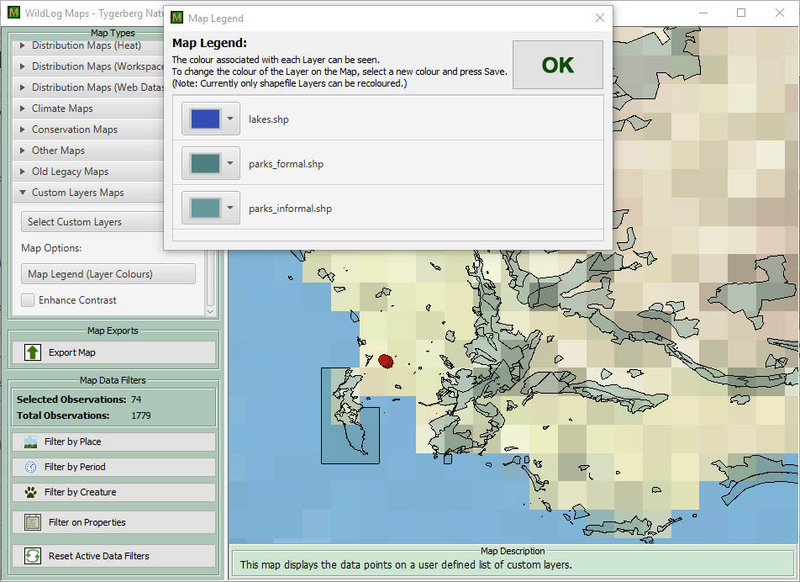 The new code also allowed me to build some interesting new maps to help you explore your dataset. 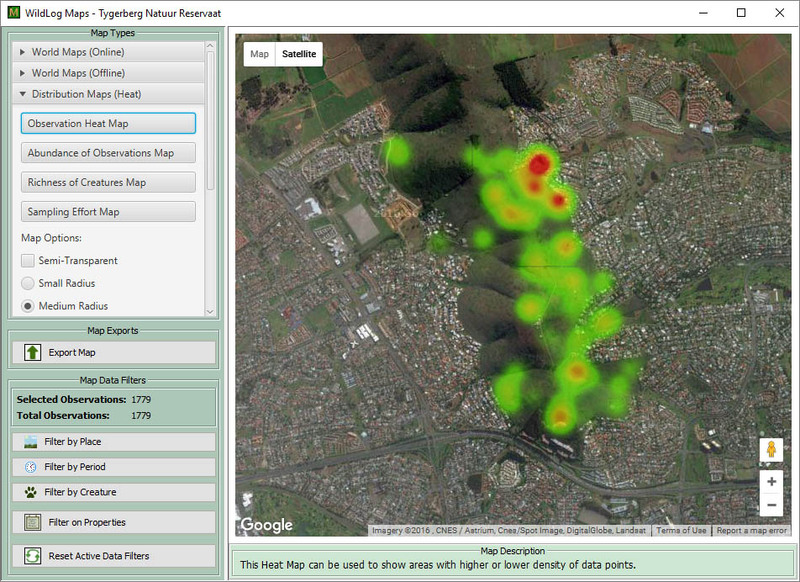 For example, the new Heat Maps immediately add a tremendous amount of value. It is still important for me to provide offline maps as well. Although basic internet connectivity is getting more and more common I still feel that one of WildLog's greatest strengths is the fact that it can stand on its own and continue to provide meaningful value even without an internet connection or third party services. Third party service providers, such as Google Maps, could cancel or change their services at any time and for me it is important that WildLog should still be able to continue to provide the core functionality should that help. For a long time I've wanted to add some GIS functionality to WildLog, and I think with this release I've finally taken the first step in that direction. I've added a new "Custom Map" that allows you to upload basic Shapefile and GeoTiff layers. 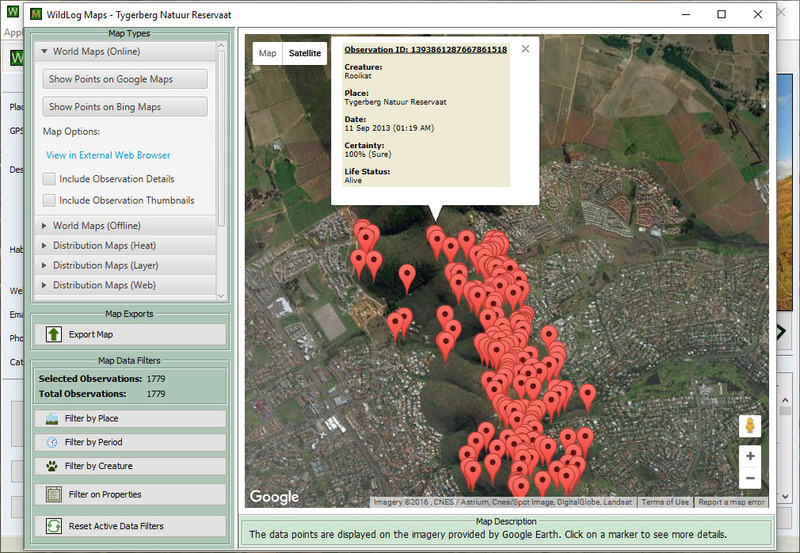 These layers can then be displayed on the map next to your Observation records. This is still a very basic feature, but if it proves to be valuable, there is a lot of room for future improvement. There has been a slew of other small upgrades, improvements, additions and fixes. For example, you can now filter Observations by GPS coordinates (using a map selection box), upgrades to the GPS popup, some amazing new reports specifically aimed at analyzing camera trap data, reports are now clickable to see the data values, uploaded portrait photographs should now be automatically rotated, improvements to various export formats, new Observation filter categories, Observation filter categories can now be saved, etc. etc. etc. I really hope you enjoy these new features, in particular the maps. I would like to thank everybody that have shown an interest in WildLog over the years. Even if it was only me using it I would still love working on it, but knowing that there are people out there that also find the application useful really helps to keep me interested and motivated to make the application better and better for a broad audience. If you experience any problems or have any other feedback, please feel free to contact me.